To store a station: 1. Tune to the selected station. 2. Select and hold the preset number for the station you want to store. You can also store a preset station by the following procedure. 2. Select the open/close icon to display a list. 3. Select the Preset tab. 4. Select and hold the preset number for the station you want to store. Lists the strongest stations on the selected band. 1. Select the open/close icon to display a list. 2. Select the Station List tab. You can store 6 AM stations and 12 FM stations into preset memory. HD Radio Technology manufactured under license from iBiquity Digital Corporation. U.S. and Foreign Patents. HD RadioTM and the HD, HD Radio, and ’Arc’ logos are proprietary trademarks of iBiquity Digital Corp. Samples each of the strongest stations on the selected band for 10 seconds. To turn off scan, select Cancel or . Displays the subchannel list when an HD RadioTM station is selected while listening to an FM station. 3. Select the channel number. 1. 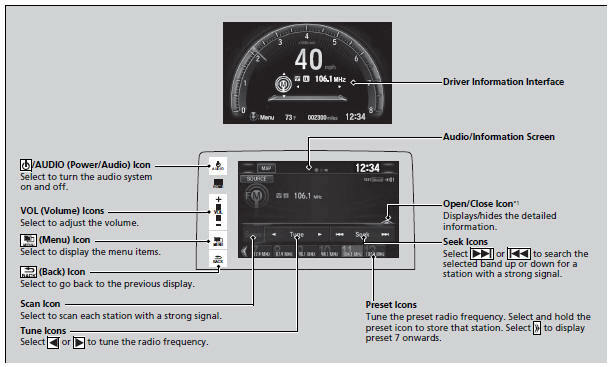 Select the open/close icon to display a list while listening to an FM station. 2. Select View Radio Text. To turn off scan, select Cancel or .